Resiblock have been involved in a number of projects with Han-Padron Associates LLP, one of the world’s leading specialist consulting Marine Engineers. 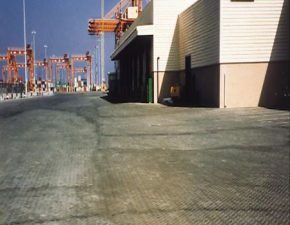 Construction of the Port of Salalah commenced in 1996 with the recommendation that the small element flexibly laid paving to be installed should be stabilised preventing sand erosion under heavy duty trafficking and water infiltration via the joint, which under trafficking ultimately leads to liquefaction of the sand laying course and migration of the finer fines. During 1998 465,000m² of small element flexibly laid paving were installed and stabilised with Resiblock ‘22’. So successful was the stabilisation of the above mentioned paver pavement in significantly reducing maintenance regimes, Resiblock ‘22’ was again specified in connection with the 35,000m² extension (Block A Port Salalah Sultanate of Oman). It is recognised that under certain environmental conditions small element flexibly laid paving will fail to self stabilise (particularly under heavy duty trafficking). Jointing sand is eroded under trafficking and cleaning regimes leading to chipping and spalling. This sand erosion serves to expedite water infiltration via the joint to the sand laying course resulting in liquefaction and degradation and ultimately structural failure. Whether at the point of construction or installed retrospectively Resiblock ‘22’ will bind the jointing medium resulting in an elastomeric bond which will accommodate the small elastic deflections required in connection with small element flexibly laid paving, further prevent water infiltration to the sand laying course, in turn preventing liquefaction and degradation and the subsequent structural failure which ensues. Contractor: Salem Mohiyaddin Bin Saif & Bros. Trad. & Cont. Co.